"There is no problem so big it cannot be run away from." The seminars are now arranged by Yury Nikulin ( ). Please, contact him if you have any queries. To students: In order to get 4 study points from the seminar you have to attend 10 seminars and give one presentation. This seminar is for postgraduate students only. The 10 seminars can also include other seminars than applied mathematics seminars. For example there are some optimization related seminars at Åbo Akademi. You should always discuss with Napsu Karmitsa ( ) or Marko Mäkelä ( ) whether a seminar can be included or not. However, the presentation should always be given at applied mathematics seminar at the University of Turku. When you want to give a presentation, please, contact Napsu. To students: In order to get 2 study points from seminars you have to attend 5 seminars and write a learning diary from all of them. The diary may be written either in English or in Finnish and it should be returned to Napsu within one week from the seminar. Instructions for writing the learning diary are given here. The seminars are mostly the same as the above mentioned applied mathematics seminars. If the seminar can not be included it will be announced in the seminar invitation. Prof. Marko M. Mäkelä: "Rahat tänne ja heti", date: to be announced. May not be included as Major Student Seminar. Seppo Pulkkinen: "Improving Radar-based Rainfall Measurements by Modern Statistical Methods", date: 10 October, 2014, time: 14:15. Prof. Ph.D. Akram Dehnokhalaji (Kharazmi University, Tehran, Iran): "Characterizing a subset of the PPS maintaining the reference hyperplane of the radial projection point", 11 September 2014. Tero Aittokallio: "From drug sensitivity to target networks: multi-target modeling of treatment response", 10 May 2014. Fatemehsadat Seyednasrollah: "A Comprehensive Comparison of the state of the art methods in RNA-seq Analysis"", 11 April 2014. Prof. Hans Metz (Leiden University): "The interplay of infectivity that decreases with virulence and limited cross-immunity: (toy) models for respiratory disease evolution", 10 February 2014. Ph.D. Kirill Kuzmin (Belarusian State University, Minsk) "Stability Analysis for Vector Discrete Optimization Problem" and M.Sc. Vladimir Korotkov (Belarusian State University, Minsk) "Markowitz's Investment Problem under Multicriteria, Uncertainty and Risk", 13 December 2013. 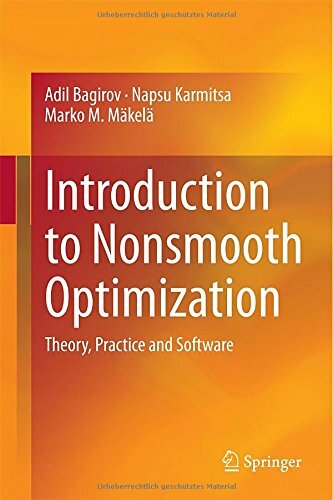 Kaisa Joki: "Nonsmooth optimization: Bundle Methods" and Outi Wilppu: "Two-Slope Parameterized Achievement Scalarizing Functions for Multiobjective Optimization", 01 November 2013. Prof. Adil Bagirov, "Nonsmooth Optimization Models in Data Mining" 29 August 2013. M.Sc. Ville-Pekka Eronen, "Extended cutting plane metod for MINLP and its variations generalized to deal with nonsmooth functions", 07 June 2013. M.Sc. Anne Seppänen, "Evolution of density-dependent cooperation and the origin of multicellularity", 25 April 2013. Dr. Stefan Emet, "A million-pound problem formulation", 22 March 2013. Sami Hokuni, "Neural networks with application to Finnish insurance company", 15 March 2013. M.Sc. Pekka Matomäki, "Optimal stopping near boundaries", 08 March 2013. M.Sc Outi Wilppu, "Multiple gradient descent algorithm", 01 March 2013. Dr. Napsu Karmitsa, "Nonsmooth Optimization in 30 minutes", 15 February 2013. M.Sc. Seppo Pulkkinen, "Optimization Algorithms for Scalable and Robust Dimensionality Reduction", 8 February 2013. M.Sc. Sergii Pidlisnyi (Dnepropetrovsk State University,Ukraine), "Mathematical modeling and definition of surface strengthening best temperature conditions", 1 February 2013. Prof. Alex Kruger (University of Ballarat, Australia), "Stationarity and regularity of infinite collections of sets", 28 June 2012. M.Sc. Olga Karelkina, "Interactive method based on parameterized achievement scalarizing function for multicriteria median location problem", 21 June 2012. Dr. Yury Nikulin, "On Accuracy and Robustness in vector Boolean optimization", 25 May 2012. M.Sc. Essi Laajala, "Type 1 diabetes biomarkers in human whole blood transcriptome", 20 April 2012. M.Sc. Antti Nurkkala, "Method for Nonlinear Segmentation of Data Using Gaussian Mixture Models", 23 March 2012. M.Sc. Anne Seppänen, "Evolution of complex density-dependent dispersal strategies", 02 March 2012. M.Sc. Pekka Matomäki, "On solvability of a two-sided singular optimal control problem", 03 February 2012. M.Sc. Seppo Pulkkinen, "Mode-Finding of Gaussian Mixtures", 13 January 2012. M.Sc. Daniel Laajala, "Analysis of tumor growth experiments using mixed-effect modeling ", 25 November 2011. Dr. Yury Nikulin, "A parameterized achievement scalarizing function for multiobjective optimization and its application in interactive decision making", 21 October 2011. M.Sc. Zuhair Iftikhar, "Empirical study on comparison of two different approaches for the robust shortest path problem", 13 May 2011. M.Sc. Seppo Pulkkinen, "Integral transformation method for constrained global optimization", 15 April 2011. M.Sc. Olga Karelkina, "On comparison of different approaches to the stability radius calculation", 25 March 2011. M.Sc. Pekka Matomäki, "Optimal stopping in stochastics", 28 January 2011. M.Sc. Tuomas Nurmi, "Modeling evolution of specialization &/mdash; metapopulation aspect", 14 January 2011. M.Sc. József Mezei, "Fuzzy numbers in decision making and information systems ", 19 November 2010. M.Sc. Jarmo Heinonen, "Ensihoitimallinnuksesta", 22 October 2010. Dr. Dmitry Podkopaev, "Influence of preference information on stability of multiobjective combinatorial problems", 8 October 2010. Dr. Kalle Parvinen, "Adaptive dynamics...", 17 September 2010. M.Sc. Anne Seppänen, "Evolution of dispersal in American pika metapopulations", 21 May 2010. M.Sc. Olga Karelkina, "On stability of a lexicographic optimum of the multicriteria combinatorial center and median location problems", 17 May 2010. M.Sc. Roman Simecek, "Sizing Optimization of a Beam on an Elastic Unilateral Subsoil", 07 May 2010. M.Sc. Seppo Pulkkinen, "Recent Developments in Model-based Derivative-free Optimization", 23 April 2010. M.Sc. Rolf Linden, "About mechanistic underprinnings of genetic interactions", 19 March 2010. Dr. Napsu Karmitsa, "Kuinka pitää hyvä tai erittäin hyvä esitelmä", 12 March 2010. Date: Will be announced about week before each seminar by email. Form: 10 seminars and one presentation for postgraduate students and five seminars and learning diaries from all of them for major students. Location: University of Turku, Department of Mathematics and Statistics. Level: Advanced and Postgraduate studies. ECTS: 4 (postgraduate) and 2 (major). Additional information: Napsu Karmitsa ( ), Marko Mäkelä ( ). The seminars will be arranged irregularly (will be announced about week before by email) usually on Fridays at 2 pm. In order to attend either of the seminars and to subscribe to the mailing list, please, fill up the registration form.